Humboldt County's economy is derived in large part from its main industries: mining, agriculture and agricultural services, tourism, service industries and construction. The county is located in the rich gold mining center of the Western U.S. In recent years, the gold mining industry has brought a period of tremendous economic growth to Humboldt County. The county also boasts mineral resources such as silver, copper, molybdenum, tungsten, iron, barite clays, uranium, and a large mercury deposit. While mining is presently the dominant industry in Humboldt County, agriculture remains an economic mainstay and way of life for many of the county's citizens. Humboldt is the leading agricultural county in the State of Nevada with over 100,000 acres under cultivation. Crops include alfalfa, hay, potatoes, grains and alfalfa seed. Mint, beans, lettuce and tomatoes are also produced in Humboldt County. 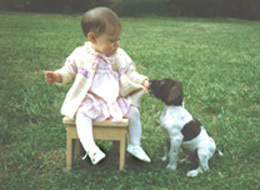 Livestock production includes mainly cattle, with a few small flock sheep and hog operations. Tourism is also an important part of the county's economic base due to the large number of visitors the gaming industry brings to the area and the draw of the beautiful wide-open spaces, historical sites, and great hunting and fishing. Elevation -- Winnemucca 4,299 ft.
Humboldt County has a total estimated 2014 population of 17,388 residents, approximately two thirds of whom live in unincorporated areas of the county. 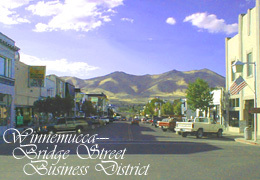 Winnemucca is the county's only incorporated city and its primary population center with approximately 7,850 residents. The remainder of the population is spread among unincorporated areas adjacent to Winnemucca; the small, rural communities of Denio, McDermitt, Orovada, Paradise Valley and Golconda; and widespread, isolated farm and ranch properties. (Source: 2015 Nevada State Demographer). Humboldt County is located in the rugged, high desert region of north-central Nevada, bordered on the north by Oregon and by neighboring Nevada counties to the west, south and east. The county's 9,704 square miles offer some of the most varied, spectacular scenery in the state and a wide array of outdoor recreational opportunities. Humboldt County is the fourth largest county in Nevada, accounting for nearly 8.8 percent of the state's total area of 110,540 square miles. Over 80 percent of the county's total area is controlled and managed by the federal government--either the Bureau of Land Management (BLM) or the U.S. Forest Service (Humboldt National Forest). 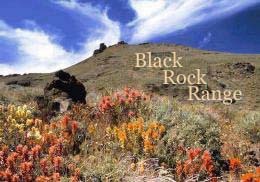 The county consists mainly of mountain ranges [including the Black Rock Range (pictured here), Pine Forest, Jackson, Santa Rosa and Sonoma ranges] and desert valleys (including a large part of the Black Rock Desert). Winnemucca lies 167 miles north of Reno and 267 miles southwest of Boise, Idaho. It is situated in a high desert valley between two rugged mountain ranges. 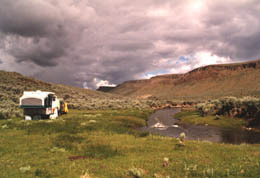 The Humboldt River winds its way alongside the community. It is the only watercourse across the Great Basin and the only major river system wholly contained within Nevada. Recreational opportunities, both indoor and outdoor, are abundant in Northern Nevada. Humboldt county's 9,700+ square miles of mountain and high desert terrain offer unrivaled opportunities for outdoor exploration and solitude. Over 80% of Humboldt County is public land managed by the U.S. Dept. of Interior's Bureau of Land Management and Forest Service. 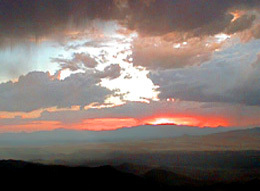 The county's varied outdoor recreational offerings include hiking, camping, rockhounding, hunting, fishing, trap shooting, archery, mountain biking, horseback riding, boat & water sports, motor sports, immigrant trails, ghost towns, natural hot springs, sand dunes, the Black Rock Desert National Conservation Area and Santa Rosa Wilderness. Big game hunting opportunities include mule deer, antelope & big horn sheep. 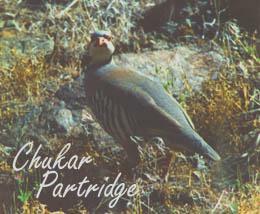 There are well-established upland game bird populations of chukar & hungarian partridge, sage grouse, quail & pheasant, as well as turkey, migratory birds & waterfowl. Or fish for trout, crappie, walleye, bass & catfish in Humboldt County's creeks, rivers, small reservoirs, lakes & ponds. Fisheries include Big Springs, Bilk Creek, Chimney, Knott Creek & Onion Valley reservoirs, Blue Lakes, Dufurrena Ponds, and Rye Patch Reservoir in nearby Pershing County. 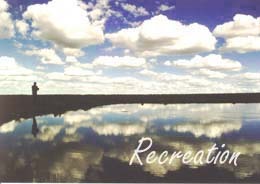 The City of Winnemucca and Humboldt County own & operate a variety of public recreational facilities. There are four city parks, two swimming pools (one outdoor + one indoor), lighted tennis courts, a skate park, seven baseball fields & an excellent 9-hole golf course. Public & private groups offer a variety of organized recreational activities including baseball tournaments, ice & roller skating, volleyball, basketball & aerobics. The Winnemucca Event Center opened in 2001 as part of the county's large, well-equipped fairgrounds complex. The facility seats 2,700 people and is by far the finest of its kind in Northern Nevada. The Center provides the community with the year-round ability to host a wide range of indoor recreational activities and could not previously be accommodated at the fairgrounds or at the Winnemucca Convention & Visitors Center complex located in downtown Winnemucca. Functions at the new Center include indoor rodeos, ropings & other livestock-related events; motor sports competitions; sporting events; other tourism-enhancing festivals & special events; as well as concerts, dances & community-oriented activities. Humboldt County is governed by a five-member elected Board of Commissioners that meets on first and third Mondays of each month. The Board appoints a County Administrator to serve as the county's chief adminisitrative officer responsible for managing the overall operations & daily administration of Humboldt County government. The Administrator directs the activities of appointed County officials, including the Buildings & Grounds Director, Building Official (inspector), Communications/TV Director, Comptroller/Auditor, Convention & Visitors Authority Director, Regional Planning Director and Road Superintendent. Other elected county officials include the Assessor, Clerk, District Attorney, Recorder, Sheriff & Treasurer. Visit Humboldt County's web site or call 775-623-6300 for more information. The City of Winnemucca is governed by an elected Mayor and five-member City Council who meet in regular session on first and third Tuesdays of each month. The Mayor and Council appoint a City Manager who presently also serves as City Engineer. 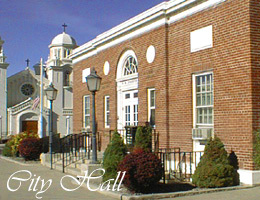 The Manager is the city's chief administrative officer responsible for the overall operations and administration of city government. The Manager directs the activities of appointed City officials including the City Clerk/Treasurer, Chief of Police, Public Works Director, Building Inspector, Recreation Director and Planning Director. Visit Winnemucca's web site or call 775-623-6333 for more information on city operations. Humboldt County was created on November 25, 1861 as one of the original nine counties of the Territory of Nevada. 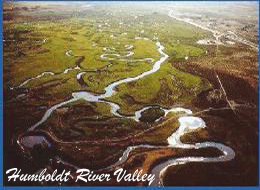 The county shares its name with the Humboldt River, which passes through northern Nevada and the southeastern portion of Humboldt County. Peter Ogden of the Hudson Bay Company first "discovered" the river on November 9, 1928 on his fifth Snake Country Expedition. The river was named by soldier-explorer John C. Fremont for Alexander von Humboldt, the German explorer and scientist, who was much admired by Fremont, but who never saw or came within 1,000 miles of the river, mountains or county which now bear his name. During the period 1841-1870, the Humboldt River funneled thousands of emigrants along its valley on their way to California, especially after the discovery of gold there in 1848. Winnemucca, located on the banks of the Humboldt River is southeastern Humboldt County, was once a supply station on the pioneer Oregon Trail. It appears the Winnemucca site has been inhabited to one degree or another since about 1830 when beaver trappers established a camp called French Ford at present day Winnemucca on what was then called the Mary River. The community's name was changed numerous times over the years until finally in 1868 the name was changed to honor Paiute Indian Chief Winnemucca. The same year, 1868, the transcontinental railroad was completed, and Winnemucca became a terminal and major shipping point for cattle, sheep, gold and silver to Reno and San Francisco. 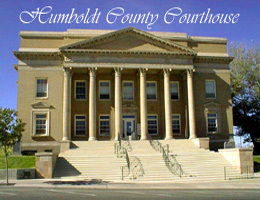 When Nevada achieved statehood on October 31, 1864, the town of Unionville (in present day Pershing County) was first designated the Humboldt County seat. But by 1872 Unionville was in decline, and Winnemucca had emerged as the main trade, teaming, railroad and population center in Humboldt County. On May 1, 1873, by legislative direction, Winnemucca was named the new county seat, and remains so today. A wealth of information on the history of Winnemucca and Humboldt County can be obtained from the Humboldt Museum located at Jungo Road & Maple Avenue in Winnemucca, telephone 775-623-2912.